Eating fresh, local and organic has come of age. Long heralded as a way of being healthy, it’s also a great way to support our local farms. With the Northwest’s temperate climate, we are fortunate enough to have fresh options year-round. Not only do we have access to an outstanding selection of the more common vegetables, it’s getting easier to broaden our palettes with unique specialty fruits and vegetables too. Following are several online lists and interactive tools available to help chefs, restaurateurs, home cooks and gardeners in the greater Puget Sound Region of the Pacific Northwest learn what’s in season throughout the year. Epicurious.com has a Seasonal Ingredient Map, an interactive map showing what’s fresh and in season in every state in the nation, every month of the year. It also provides ingredient descriptions, shopping guides, recipes and helpful tips. Seasonal Cornucopia was a project started by Becky Selengut, chef and instructor at Seattle-based Cornucopia. What began as a tool to better help her in her own work turned into a useful tool for the rest of us to learn what’s in season now. It also has a handy search feature showing when the foods we’re seeking will most likely be in season. Be sure to check out Becky’s cookbook, Washington Local and Seasonal Cookbook, with recipes handily arranged by season. The Neighborhood Farmers Market Alliance posts a weekly fresh sheet with full details on what farmers will have at the markets. 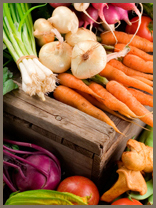 They also provide a short list of what produce is available throughout the year, listed by month. The Ballard Farmers Market posts a monthly listing of not only which products are fresh, but which ones are going out of season. Eat Well Guide® is a free online directory of thousands of family farms, restaurants, and other outlets for fresh, locally grown food. Originally a database of sustainably-raised meat and dairy producers, its listings have expanded to include farmers’ markets, CSA programs, partner organizations, water-conscious ratings and vegetarian eateries. Visitors can search by location, keyword or category to find good food, download customized guides, or plan a trip with the innovative mapping tool Eat Well Everywhere.